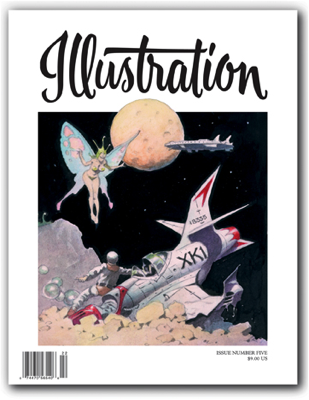 In this issue: The work of legendary illustrator Roy G. Krenkel; Nell Brinkley and the Brinkley Girls by Trina Robbins; James Dwyer: Fine Illustrator and Favorite Uncle by Barry Dwyer; Frank Frazetta: The Creative Moment by Dr. David Winiewicz; and the art of Albert Staehle by Sharon Damkaer, best known for his anthromorphic animal illustrations (particularly Smokey the Bear.) Book Reviews, Exhibitions and more round out the issue. 80 pages in full color. Sold out.